The Stratays F120 printer has just been unveiled by Stratasys at AMUG 2019. The F120 is an industrial-grade 3D Printer developed to empower offices, work groups and educational institutes. 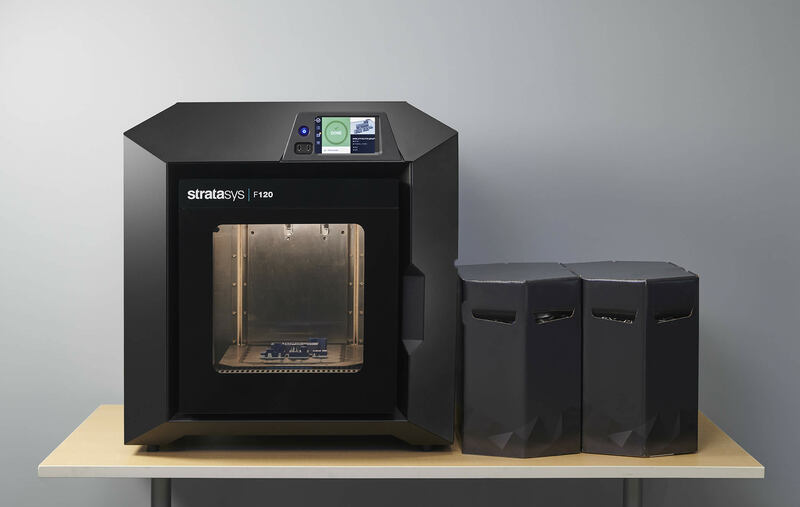 The F120 is the newest member of the Stratasys F123 Series and will perform with the same reliability and ease-of-use as the larger 3D Printers in the series. With the new F120, you can simply plug and play and have access to precise, reliable and professional 3D printing. Fast, easy material change-out, plus auto-calibration ensures you spend less time troubleshooting and more time prototyping. One of the key features of this new 3D Printer is continuous production for non-stop 24/7 production. The industrial-grade F120 was designed for high utilization and long life, while remaining affordable, accessible and reliable. Using FDM Technology the new Stratasys F120 is beneficial to various industries and will play a significant role in high schools and post secondary facilities, engineering/design agencies as well as small to medium enterprise work groups. With an F120, students can learn on the latest 3D technology, widen their design capabilities, and run fast reliable printing. Learning about additive manufacturing with an industrial grade F120 will help prepare students for a future in the industry. For many industries, the ability to create realistic prototypes is extremely valuable. Altering designs and making modifications without having to re-manufacture the part several times reduces development cycle times and costs. Coil wound SR-30 support material ensures best performance to streamline the hands-free support material for post processing. Enjoy industrial quality and performance from a plug-and-play machine sitting in your office. Reliable, high quality and easy to use technology ready to improve education and rapid prototyping. Improve your productivity and experience with a desktop system. To learn more about the Stratasys F120 visit our site or contact us at 1-877-219-6757.